Establish reliable and reproducible method to attach thiolated DNA to Au. 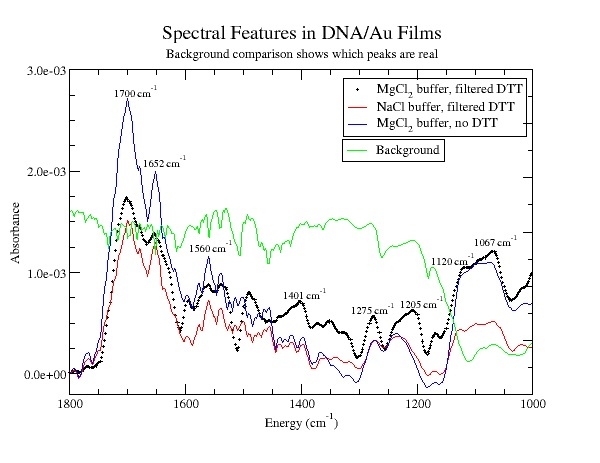 Confirm DNA attachment using FTIR and AFM. Determine utility of DTT (Reductacryl) activation. If necessary, figure out how to block non-specific binding. 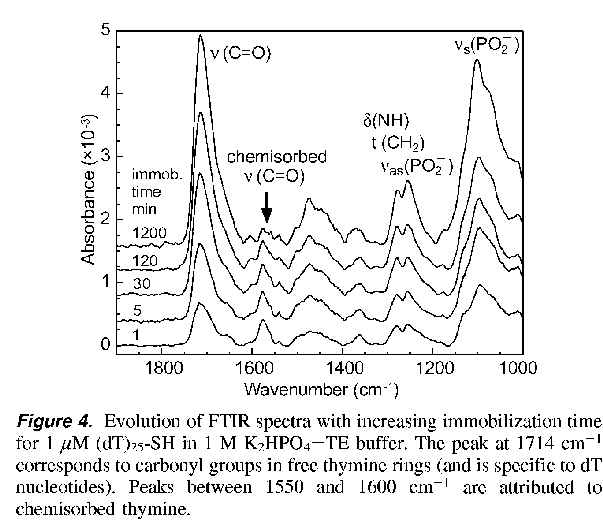 "Surface Structure and Coverage of an Oligonucleotide Probe Tethered onto a Gold Substrate," E. Huang et al., Langmuir 17, 1215 (2001) (source of TE/NaCl buffer recipe). K-20 in TE: MgCl2 with Reductacryl, filtered. K-20 in TE: MgCl2 with Reductacryl, not filtered. K-20 no linker in TE:NaCl with Reductacryl, not filtered. K-20 in TE:NaCl with Reductacryl, filtered. K-20 in TE:MgCl2 without Reductacryl. Mark o-ring positions on glass slide with diamond scribe and label them. Piranha-clean top glass (3 mins each), rinse thoroughly in DI water (5 mins) and blow-dry. Sonicate teflon o-rings in acetone and IPA, rinse in water and blow-dry. Move DNA aliquots from freezer to refrigerator. Measure 4 units of 75 microg each of Reductacryl and place one unit in the bottom of each of four microfuge tubes (see calculation.) Label two tubes "K20 MgCl2," one "K20 NaCl" and one "K-20 no-linker." "Descum" three Au/Cr/glass slides and the three top plates using oxygen and argon plasmas in the RIE with recipe hipress2.prc. Move DNA aliquots from freezer to bench. While the RIE is pumping down, vortex and spin-down DNA-containing microfuge tubes before dispensing. Add 240 microL (3x 80 microL aliquots) to each of the four tubes. Rock for 15 minutes. Place the clean Au slides in the test jig and assemble the teflon gaskets and glass plates on top. Dispense 240 microL of TE/MgCl2 buffer into cell No. 4. Vortex and spin-down DNA-containing microfuge tubes before dispensing. At end of 15 minutes, dispense solutions cell No. 2 (K-20 unfiltered), cell No. 3 (K-20 no linker unfiltered) and cell No. 6 (K-20 no Reductacryl) into their compartments. Withdraw the solution A using a syringe and dispense through a 0.2 micron cellulose syringe filter and hypodermic needle into cell No. 1. Repeat with cell No. 5. Seal all compartments with Parafilm. Let sit overnight in a darkened, N2-backfilled cabinet. Remove the parafilm, top glass and gaskets. Soak the top glass and gaskets in ddH2O. Wash the slides twice in TE:MgCl2 buffer for 10 minutes and blow dry. ;neutral or slightly alkaline such as pH 7.5). ;o Use a ratio of 1 mg oligo with 50 mg resin to ensure complete reduction. ;o Stir or agitate at room temperature for 15 minutes. ;or can be stored for brief periods of time before use. 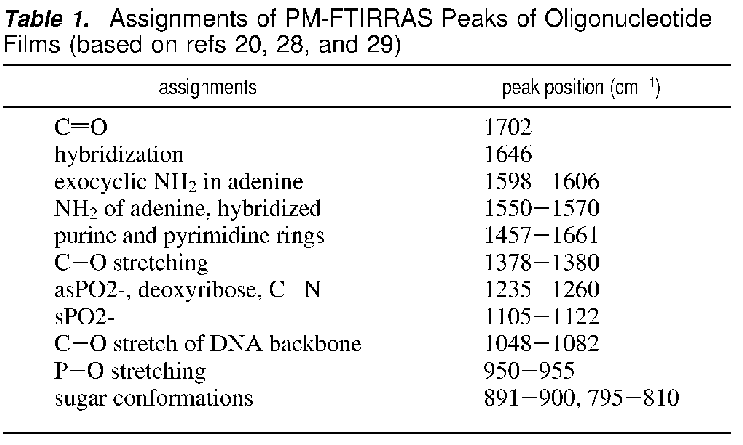 ; What is the weight of 80 pmol DNA? ; microL of 10 microM solution. ; buffer produces 80 microL of 1 microM solution. ; Consider 200 microL of 1 microM K-20. last updated $Date: 2006/05/25 17:06:44 $ ..